It has been so gloomy here that my pictures are just not coming out correctly. Wanted to get this post up today, so I just went with the not so perfect photos. Playing along at a couple of challenges today with this happy little snowman. I masked a portion of the bottom and right side edges, then swiped the ink across the card stock. 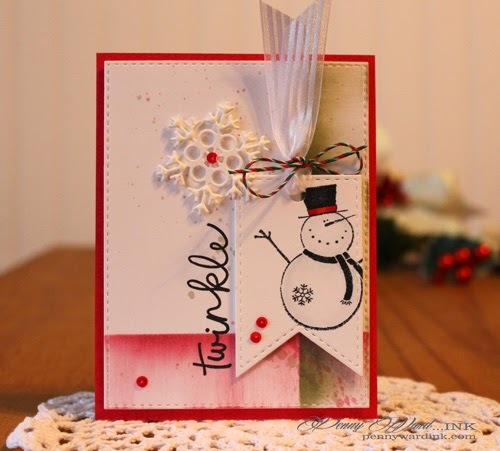 Die cut tag, stamped and colored snowman. After die cutting the snowflake, I added Marvy Liquid Applique to just the tips, let dry, then puffed it up with a heat gun. How stinkin' cute?!? It's Friday...woohoo!!! I like to thank all the newcomers to my blog each week. Thank you for taking the time to visit and follow me. Hopefully you find something that hits your mojo button here. Such a fabulous card. 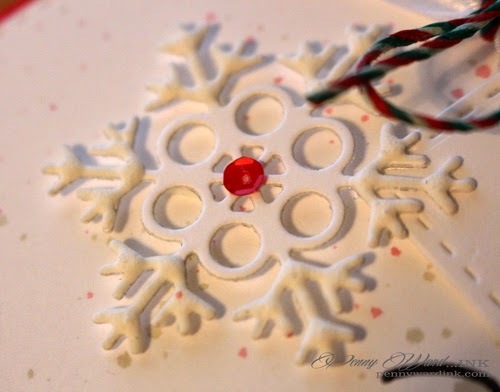 I love the image you have used and brilliant snowflake die cut. Beautiful layering and details, Penny! Thanks so much for playing Simon Says Stamp Wednesday “Christmas/Holidays” Challenge! 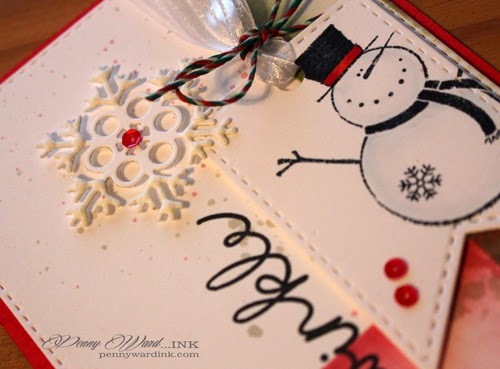 Penny...this is just stunning and I love your shading of the red and green, gives your card so much beauty. And your sentiment, Twinkle, so so perfect. Thank you so much for playing along with us at The Card Concept. Beautiful card. Love your red inking and that happy and friendly snowman. 3 cheers for using old stamps. Why should the new ones have all the fun, right? Thanks so much for playing along at CASology this week. Nice color on the BG. Thanks for joining the fun at The Card Concept!